Home automation is everywhere these days, from lights that go on with the flick of a wrist to refrigerators that can tell you what you need. But, as great as all these gadgets are, they don’t run themselves. You see, if you want your lights to go on with a simple command or need your house alarm to engage at 6 automatically, you need to program them and control them. Which means you need gadgets for your gadgets. And if you’re like me and lose the remote every hour or can’t even program your phone, the idea of all that might seem like too much. Thankfully, it’s not thanks to the many smart home hubs you can buy. Designed to look like a speaker, these hubs can control multiple devices, as well as perform other services so that you can do everything with one gadget. To help you choose the best one for your home, I’ve reviewed and ranked the Top Smart Home Hubs of 2018. 2 Smart Home Hubs: What Can They Do For You? Now it is time to take at the best home automation hubs on the market. I’ll give you the pros and cons of each, explain how easy or difficult it is to operate and give you a rundown of what systems and devices it’s compatible with, to make choosing easier than ever. 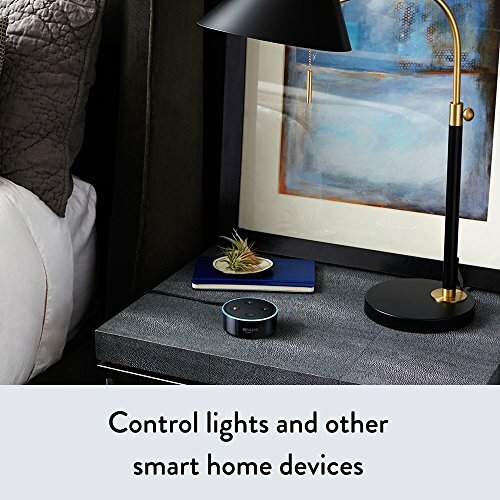 Amazon’s Echo Plus with Philips Hue Bulb included, featuring the infamous Alexa, can give the SmartThings hub a run for its money, boasting exceptional quality and a myriad of functions to transform your home into a seamless smart hub. Honestly, if the Echo Plus was a bit cheaper and connected to more device brands, I probably would have ranked it number #1. Especially since, unlike other Amazon Echo products, it has a built-in hub. Voice-activated, Alexa will walk you through the Echo Plus setup, “answer” questions, control devices and even tell you a joke. A blend of fun and function, it’s a great addition to any home. The Echo Plus looks deceiving; it seems like every other Amazon smart speaker but it has something really special hiding under the surface: a built-in smart hub. 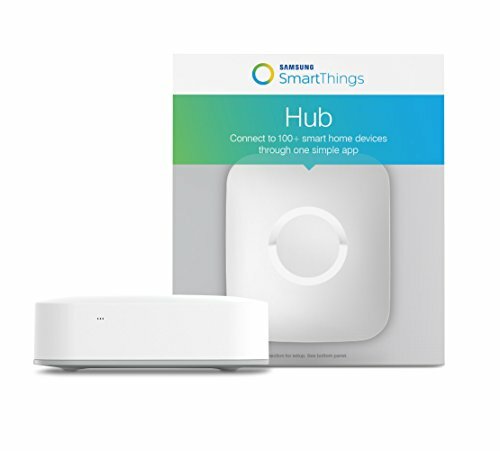 The hub is a crucial component, allowing you to control hundreds of smart devices, from bulbs to cameras, with little or no set-up. For instance, while the Echo Dot can control your smart bulbs, since it has no hub you need to take several steps, from naming them to creating commands, for that to happen. Not with the Plus; you can ask your Plus to “look up” nearby smart devices and it will scan the area and automatically connect with any you have in your home. Alexa is one of the big selling points here, like Siri, only better. Thanks to seven internal, noise-cancelling microphones she understands things clearly and is helpful, which makes using the Echo quite a pleasant and stress-free experience. A blend of fun and function, she, and the Echo and Dot, are a great addition to any home. The first thing you should know is that you do NOT need an Amazon Prime account to use the Echo or the Dot, a common misconception. 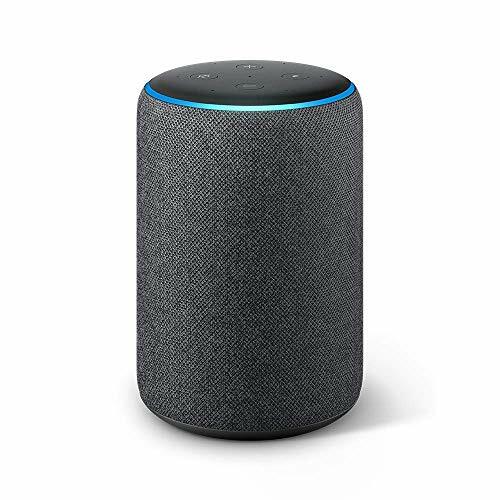 Also, the Echo and Dot are essentially the same, except the Dot is not a full-sized Bluetooth speaker and should be hooked up to a home speaker system if you want to listen to music right. The Echo, at just under $150, has exceptional sound, but the Dot, at just under $50, is no slouch for casual use. As for what they can do, the answer is plenty! For those with a Prime account, you can stream Prime music and programming with it. You can also order select items through it using Prime, like groceries; sorry, no clothes or jewelry as of now. For those without Prime, you can still stream using services like Pandora, Spotify and more. And you can also order from places like Domino’s or have Alexa call you a cab from Uber. Yeah, kind of cool. Even cooler is all the ways you can use it and learn from it. The Echo has “skills,” which are apps that can tell and teach you things, like what the weather will be or give you a complete exercise routine with instructions. There are over 100 skills as of now, with more to be added. Some are silly, like Beer Trivia, but others, that’s what is great about this device- it’s part convenience part entertainment. Not so silly are the recipe and cooking instructions Alexa can tell you, or the grocery shopping list, a personal favorite of mine. She can also set alarms, tell the weather or give you the latest news headlines from the top papers. And probably the best feature of all (especially if you have a forgetful hubby) is her hands-free call/text/messaging feature. Kneading dough and want to call your spouse to pick up juice on the way home? No problem, just tell Alexa to dial him up and it’s done. Alexa can also send a message and even call anyone who has an Echo. So you can “pop in” on your kids if you have a Dot in their room or annoy your sister and find out what she’s cooking for dinner. The one negative with these 2 devices is they don’t connect to as many smart devices as other hubs, so, if your house is decked in smart gadgets, you’ll probably need a SmartThings or Winks with the Echo. But, if you have a simple home setup, the Echo or Dot may be enough, as it is compatible with many of the top brands, including Belkin lighting and switches, Invoxia Fridges and Ford cars. Personally, this is my top pick, because it works with well over 200 devices, which is significantly more than any of the other hubs. It’s also exceptional regarding performance, providing endless integrations. 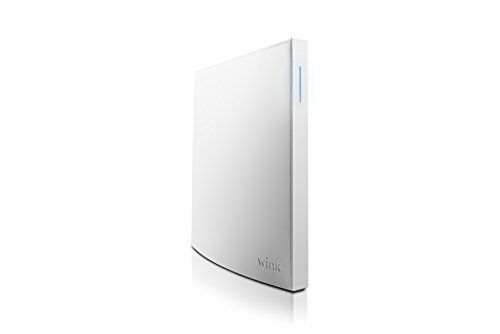 It connects using WiFi and is Z-Wave- and ZigBee-enabled, allowing you to control multiple devices without needing to use several apps or single-use hubs. Even better, it gives you plenty of options on how to control all those devices. For example, you can turn down the lights and change the color if you have the Philips Hue lighting system. Speaking of which, in addition to Philips, this device works with the Amazon Echo, Nest Thermostat, several of the Belkin WeMo devices and more. They’ve also added Bluetooth radio, which is set to be available in the next 6 months. Now, without getting too technical, I need to point out the extraordinary integration and customization possibilities for anyone with even the slightest tech knowledge. The many ZigBee powered SmartThing sensors, such as water leak sensors, motion sensors, and more are a homeowner’s dream while the IFTTT channels let you custom command whatever gadgets you have. Plus, there’s a backup battery, so if you lose power, your SmartThings hub can still monitor and alert on devices you mark as important, like door sensors. And sadly, once you find what you’re looking for, the steps to program them is a bit muddied too. It’s not the worst, but it needs to be improved. However, give yourself some extra time for programming because the good outweighs the bad here, especially when you consider the under $75 price tag. This second generation hub is ideal for those just getting into home automation and is both reliable and easy to control. While it lacks the bells and whistles of the SmartThings and Echo, it has plenty to offer and integrates well with just about every system and device. Plus, setup is “smart,” with easy to follow steps that are logical to even the greenest tech user. Fitted with an Ethernet port to connect to your router, it works with Bluetooth LE, ZigBee, Z-Wave, and Clear connect. It’s also compatible with a slew of devices, including Nest thermometers and cameras, Alexa, Google Home, and more. Setting up commands for them is super simple using the app, but that simplicity extends to how you command them. The ability to set up robots for express actions is simple and kinda cool. Here’s an example: you can have the app alert you if your home camera picks up movement. And you can set schedules to turn things, like your lights, on and off at set times. So, even though you don’t have complete control as with some of the other hubs, you have some leeway, giving you a bit more customization. At under $100, it has a lot to offer and is an excellent way to begin your journey to home automation, but for advanced users, the simple system will leave you frustrated. 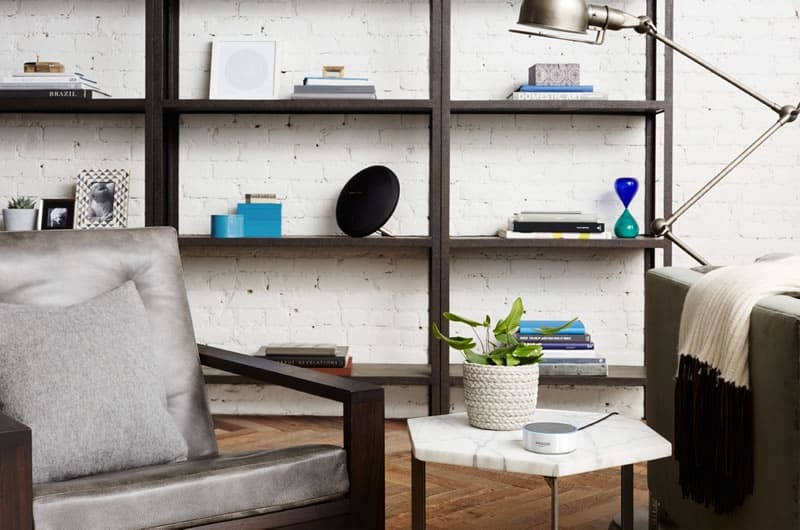 Google, the king of Internet search engines, brings that technology to you with it’s Google Home smart hub. 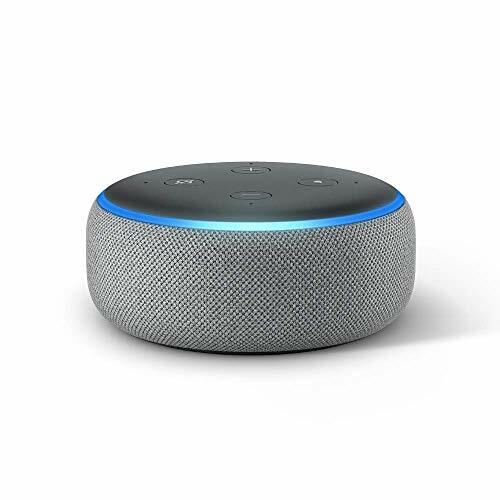 Similar to the Echo and Dot, it is voice activated and acts as a personal assistant, helping you set up your calendar or make a shopping list. However, it is limited in what it can control and do; Instead, the main selling feature here is the Google search and integration. Unlike the other hubs, this one can search anything you need to know using the Google browser and connects to your calendar to tell you your schedule. Even better, using Google maps, it can alert you to traffic jams on the way to those meetings. That being said, it cannot connect to Gmail or Google Docs and you can’t alter your calendar or set reminders, so there is definitely room for improvement. As for controlling other devices, it hits the main players, as it works with IFTTT, Nest, Chromecast, Philips Hue, SmartThings, WeMo, and Honeywell. It also is a bit more flexible in terms of phrasing than Alexa, accepting nicknames for some devices and giving greater control. And like Alexa, it can tell a joke and stream music; giving it a slight edge, it can also play Netflix on your TV. Just say: “play Scandal on the bedroom TV” and it will! Overall, it is a solid system, but at a little under $150, unless you live and breathe Google, you are better off with one of the other hubs. Smart Home Hubs: What Can They Do For You? Smart hubs are automation devices on their own, with the added ability to allow you to control other smart gadgets, like the Nest thermostat or Philips Hue lights. Can you use these devices without a smart hub? Yes, but then you’ll need to either invest in multiple remotes or use different apps from your smartphone or Smart TV. Entertain: Many systems, like the Amazon Echo, can play customized music based on artists, stations or even moods. You can “ask” it to play something bluesy, have it stream your favorite radio station or put your favorite playlist on repeat. Think of it as a DJ in a can, only better. Inform: Need the latest news, or want to know who won last night’s game? You can find all that and more using your hub. It can be used to listen to talk radio, here news reports or give you game scores. So you’ll always be up to date on what’s happening in the world. And on a less serious note, you can also be up to date on when your favorite show is on TV or what time that movie you want to see starts. Teach: If you need a little extra help in the kitchen or want to learn a new skill, a smart hub can assist you with that too. Many can be used to walk you through a recipe or prepare a shopping list. And some offer tutorials on particular hobbies, from how to mix drinks to surfing tips and beach reports. For parents, it can be a Godsend, helping them help their kids with algebra or to prepare for a vocabulary test. I hope my review of the Top Smart Home Hubs of 2019 makes finding what you need easy and stress-free. As you can see, there is a hub for every price point and skill level, so it comes down to compatibility. Be “smart” and pick a hub that works with what you have and will make your everyday life simpler. Trust me; it will be the best investment you ever made!